We are on the verge of a League Cup quarter-final with Sunderland at Nene Park – but first, there’s the small issue of Cambridge United. Flat bottom of the table, their three ‘star’ players are all defenders, which I assume is of great concern to their fans considering they’re conceding an average of two goals per game. And up top, their strikers aren’t scoring much, plus the man with the most goals – Alex Revell – has twisted his ankle and won’t play. It looks like the perfect way to prepare for a big cup tie, and the fact that Cambridge United’s kits are the same colour as banana skins doesn’t concern me one jot. I decide to shuffle the pack ahead of the Black Cats. 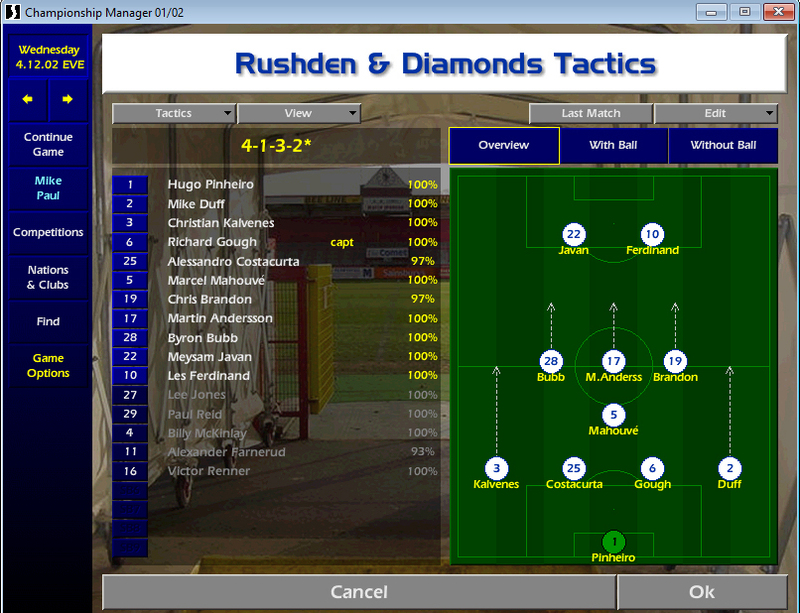 Pinheiro, Costacurta, Victory, Brandon and Farnerud keep their places, but the rest of my positions change. Pflipsen comes into centre-mid for what might be one of his last few chances in the side, Mustafa gets a run at right-back, Reid will partner big Billy at centre-half, and up front, I let the Great Dane have a go with Victor Renner. For my (mostly) second string, this is a pretty good-looking team. Costacurta in particular – what a dish. As expected, Cambridge are pretty crap, though it shouldn’t take away from the quality of our first goal – and guess who scores it? That’s right, after Farnerud finds Møller in the box, the Great Dane’s blasted effort is saved by Andrew Marriott, and Karlheinz bloody Pflipsen is there to smash home the rebound to put us a goal up in just the fourth minute. My calculated public denigration of the German has obviously lit a fire under him, and he’s in the action again, lifting a free-kick into the box that Renner heads goalwards, Marriott saves, Reid follows up, Marriott saves again, but Chris Brandon is there to finally place the ball past the despairing Cambridge keeper to put us 2-0 up, and there’s no doubt that we deserve it. The loss of Gazza means that Jamie Victory is my main man over dead balls, and in the 26th minute, he shows us what he’s made of by smashing a free kick straight into the wall – but it spins up into the air, loops over the defence, and the ever-alert Brandon sneaks onto the end of it and pokes past Marriott for three! The game is surely over as I check my watch, and in doing so I almost miss our fourth goal – straight from kick off, Reid collects a loose forward pass and feeds it out wide to Mustafa, he rockets down the right and crosses for none other than Alexander Farnerud to nod home his fourth goal of the season, and our fourth of the day. The half-time whistle goes, and to be honest, Cambridge have lived up to their billing. Sensing that the game is over one way or another, I put Gough on for Costacurta – half a game each to prepare for the Black Cats – and also introduce Mahouvé for Bagayoko in order to try to fulfil my Cameroonian knee-breaker’s work permit requirements. The sight of Marcel the Destroyer emerging from the tunnel for the second half presumably brings tears to the eyes of the Cambridge players, who barely even try to mount a second-half comeback – though Pinheiro is forced to save twice from Dave Kitson – and we pretty much coast through to record another stunning win. Exactly as I hoped, Tranmere Rovers are skidding off the road following the loss of their manager and best players, and they go down 1-0 to Huddersfield in their latest outing – while Bristol City overcome Wycombe to overtake them into second place. 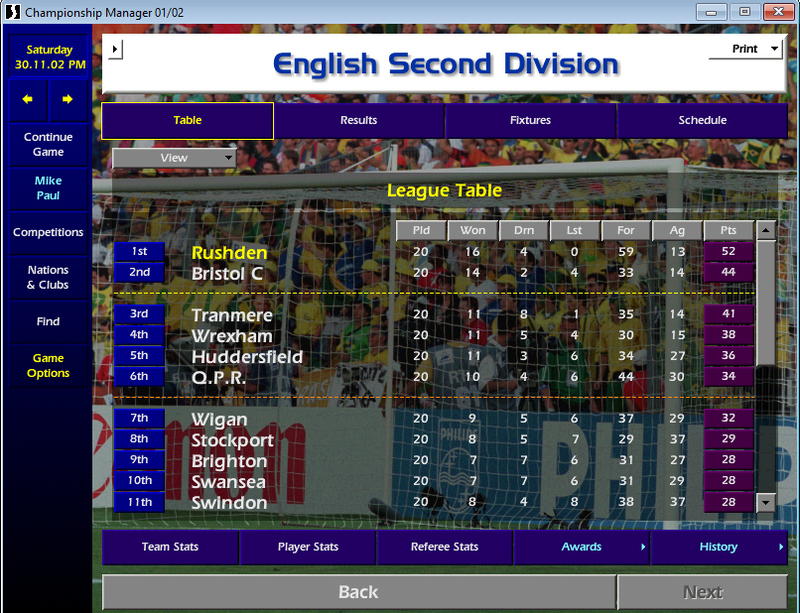 However, the big news is that after our excellent unbeaten run, we’re now sitting pretty at the top of the table, leading the pack by eight points after 20 games. We return to Nene Park on a high, though Chugger has to push through an assembled mass of journos at the front gates. After we get through them and into the media centre, I’m told that not only have I been named Manager of the Month (of course) but young Alexander Farnerud has finally been recognised as Young Player of the Month. A long overdue decision if you ask me, young Alex has really kicked on this season, both in terms of his performances and his attributes. He’s well on the way to thrashing all of his goal and assist stats from last season, and looks like he could be a top player. Congratulations, son. I check in with my squad after the game, and notice something rather odd. Paul Reid, our excellent centre-half loanee, is only valued at £70k by Rangers. Before we signed him, he was worth well into the millions, so I can only assume that his arrival in Irthlingborough has caused his value to plummet completely. While I should be more upset at the social commentary implied by that, instead all I can see is that we might be able to nab an England U21 centre-half for peanuts, so I submit a formal bid for him. We are incredibly short at centre-half, so that could be quite a turn-up for the books. Right then. Get the shiny shoes, ill-fitting jackets and Lynx Africa out, because we’ve got a hot date with Peter Reid and Sunderland in the League Cup quarter-final. 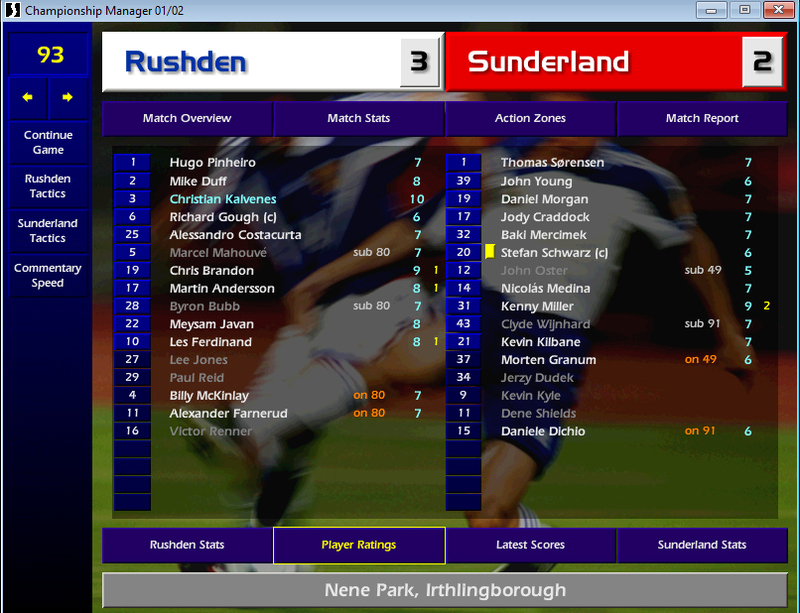 Now, this isn’t the Sunderland that those of you familiar with CM01/02 might expect – since I don’t have the patch installed, they don’t have Tore André Flo, Claudio Reyna or the severely overpowered Matthew Piper plundering the goals from the right flank – but they are still a very good team. They’re 10th in the Premier League having gone pretty heavy in the summer transfer market, splashing out a combined £12.75m on the likes of Jerzy Dudek, Steve Finnan, Clyde Wijnhard and Stephen Hughes to augment a squad that already contains Thomas Sørensen, Julio Arca, Julius Agahowa, Zinedine Kilbane and Kenny Miller. My scouts helpfully tell me that Kevin Phillips is a dangerous striker, thanks lads, and I can see that they’re likely to line up in a 4-4-2, as is Reidy’s wont. Your mighty Diamonds are familiar with the latter stages of domestic cup competitions, as you know, so I name a nerveless and experienced starting lineup. Pinheiro obviously starts in goal and Duff obviously starts at right-back. Kalvenes returns at LB for the cup-tied Jamie Victory, while Gough and Costacurta will have to use every drop of their combined experience to shackle Kevin Phillips and Kenny Miller. Marcel the Destroyer naturally comes back into DMC with a glint in his eye at the sight of Stephen Hughes’s skinny little legs, while Javan and Sir Les are my preferred strike partnership. Midfield is more of a conundrum, as everyone has been playing themselves into my thoughts recently. Farnerud is a little tired, so I decide that Brandon, Andersson and Bubb will step out in front of the Peter De Banke Terrace. Bubb’s nine goals this season have already eclipsed his total from last term (7), and I’m hoping he can explode into double figures today. A League Cup semi-final is at stake. Simply The Best reverberates around Nene Park. Light snow is gently and atmospherically falling onto the head of every mascot. The mood is buoyant as my unbeaten warriors take centre stage. Let’s give them a bloody good seeing to. First of all, I’m delighted to see that Reidy has taken us lightly by not including Kevin Phillips in the squad at all, and also starting youth players in their back four – only Jody Craddock isn’t a reserve. His bench is also an absolute treat: Jerzy Dudek is their backup GK, and their other subs are Kevin Kyle, Danny Dichio, Dene Shiels and Morten Granum. What have they got in common? Correct: they are *all* strikers. He’s also playing two DMCs in centre-mid, although Nicolas Medina has frighteningly good attributes across the board, so I tell Marcel that I don’t want to hear a single squeak from him all game. We start brightly, as we do so often, and in the fifth minute, Byron Bubb skips clear of the Sunderland defence! He’s clean through on goal! He’s taken out by Young!! The referee thinks about it for a moment… looks at his linesman… NO PENALTY! HOW COULD YOU!! WHAT GAME ARE YOU EVEN WATCHING? MY GOD. We are in the ascendency, but there is a constant, lingering threat from Sunderland, who despite having some backup players in their team, still have some real quality. Kilbane, Schwarz and Miller are creating chances, but thankfully their excellent build-up play usually ends with the ball falling to Wijnhard, who scuffs every shot wide. I try to disguise how nervous I am by doing a bit of shouting and pointing on the sideline, and my team summarily start creating chances. Andersson hits a low drive from the edge of the box that flies past a motionless Sørensen but pings back off the post, then my second-favourite Swede lifts a cross into the box that Sir Les powers at goal, but Sørensen pushes away. Afterwards, Gough and Costacurta are knocking the ball between them, I imagine showboating, before Zeus thunders a long ball forward that Javan takes down, drives into the box, looks up, squares for Chris Brandon! BRANDON! 1-0 DIAMONDS!! Right in the postage stamp! It’s 1-0! We’ve got a narrow lead, but the game is still incredibly even. Sunderland are in the commentary a lot and I’m making a constant high squealing sound as they get a bit too close to our goal for comfort. Sørensen clears after Bubb is caught offside, and Kilbane collects. He advances down the left once again, manages to somehow get away from Duff, and swings in his third or fourth cross of the day – but this time, he manages to get it over the hopeless Wijnhard and straight onto the bonce of Kenny Miller, and the young Scot nods past Pinheiro to tie up the scores. However, my lads don’t let their heads drop, and straight from kick-off, Costacurta robs Wijnhard, feeds Kalvenes, he volleys the ball ahead of Sir Les – his touch is exquisite, his turn sublime, his effort is past Sørensen, and our lead is restored! Sir Les makes it 2-1!! And my players aren’t finished either – just minutes later, Mahouvé heads the ball onto the bar, then shortly afterwards feeds Brandon on the edge of the box, he strikes, Sørensen saves, and Martin Andersson follows in and slips the ball home!! I can’t believe it – it’s 3-1 with half an hour gone!! I’m so tense you could snap my fingers right off as Sunderland dominate us for the last 15 minutes of the half. However, they haven’t counted on our monstrous goalkeeper, who is in the way of efforts from Schwarz, Medina and Miller, while also saving a point-blank header from Baki Mercimek. Hugo PinHERO, more like – especially since he’s almost single-handedly maintained our lead, and we head into the dressing room with our 3-1 lead somehow intact at half time. There’s not much I can do to change; everyone is playing well and I don’t see any subs I could make at this stage that would make much difference. I note that Mahouvé is quite tired on just 77%, so I ask him if he’s alright. He just looks at me. I’m sure he’s fine. The second half gets underway and it’s back and forth. Sørensen is forced to make two saves from Bubb and Sir Les – then Kenny Miller picks up the ball, looks up, and clatters an absolute hellraiser out of nowhere that almost breaks the net; Pinheiro doesn’t even move. From nothing at all, Sunderland have clawed their way back into the game, and at 3-2, I shakily open my dugout drinks cabinet and pour myself an absinthe over ice to settle my nerves. Quite honestly, with ten minutes left, I still have no idea what changes I should make – the team are looking fine, everyone is playing well – but for the sake of freshness, I sub Marcel and put Mad Dog on in his place, and also let Farnerud have a go in place of Bubb. We are seriously under it now. Granum is on for John Oster, who was completely shut out by Kalvenes, but the sprightly Norwegian causes us problems from the moment he takes the pitch. He gets to the byline and crosses for Miller – Pinheiro saves from close range. Miller bursts through again and hits a savage shot, but Pinheiro turns it away again! Then, Medina passes forward, Schwartz gathers in central midfield, looks up – Pinheiro is off his line. Oh god. Schwartz lobs towards goal, Hugo is scrambling back… and manages to tip the ball over the bar!! We’re in the 91st minute as Dichio comes on for Wijnhard, Granum step up and whips the corner in – straight onto Dichio’s head! BUT HUGO SAVES! AND IT’S ALL OVER! We’re in the League Cup semi-finals for the second season in a row! Wow, wow, wow. What a result!! I am absolutely buzzing after that one. What an amazing performance from back to front. Gough is starting to worry me – I swapped him with Billy so he didn’t have to mark Miller for the second half and he still finished on a 6 – but let’s not worry about that right now. Kalvenes and Brandon were outstanding, we tested Sørensen a few times, and okay, we did concede twice, but Kenny Miller is quality – and big Hugo was immense in goal. The game giving him a 7 at the end is embarrassing; he deserved far more than that. But we won’t quibble. Everyone down the Rose & Crown! We’ve got Macclesfield next in the FA Cup, so our reserves can take care of them – someone get a round of skittle bombs in!